An Atrial Septal Defect (ASD) is a hole in the atrial septum, or muscle wall, that separates the upper chambers of the heart, the right and left atria (singular = atrium). Because of the lower pressure in the right atrium, this hole typically allows oxygenated blood from the lungs to move, or shunt, from the left into the right atrium. 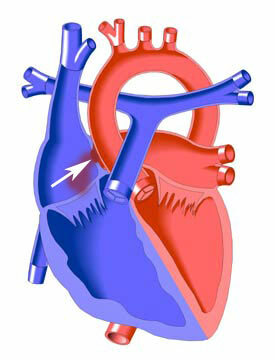 This blood proceeds into the right ventricle, which pumps it back to the lungs rather than to the body. ASDs vary in size and in the severity of symptoms they may cause. They account for between 5 and 10 per cent of all cases of congenital heart disease and are twice as prevalent among girls as boys.